You spend a lot of time in your bathroom over your lifetime. It’s the place you go to unwind after a long day. It’s a place that greets you every morning when you’re at the most vulnerable. A bathroom should be a place that makes you feel good and not dampen your mood. Entire bathroom renovations can be costly but there are little ways to improve the look and feel that won’t cost the earth. 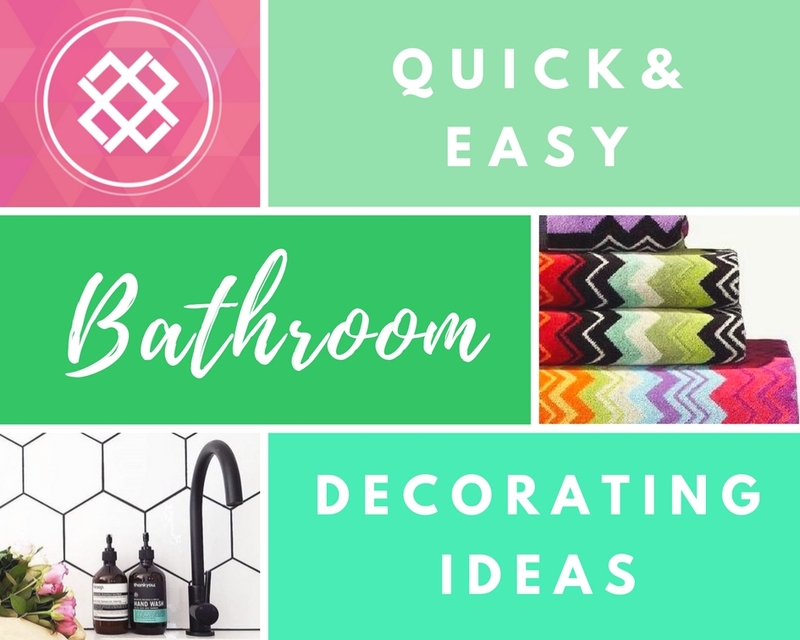 Read on for my quick and easy bathroom decorating ideas. An area that can sometimes scream dated are your light fittings. Lighting is often overlooked in bathrooms, you should have light sources coming from multiple areas to ensure no “dead zones.” Downlights are handy, but really after a bad nights sleep, downlights are not your friend. You can also add lots of atmosphere by adding LED strip to underneath floating shelving or cabinetry. 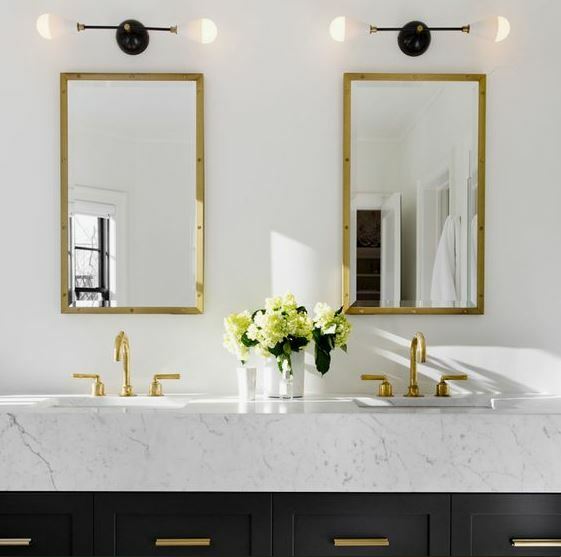 Lighting in your bathroom needn’t be purely utilitarian either, think outside the square and add a pendant or decorative sconces to the vanity area. This style of lighting can be very flattering also. The most simple and straightforward way to change your bathroom is adding a new lick of paint. Paint is your best friend when it comes to quick makeovers. 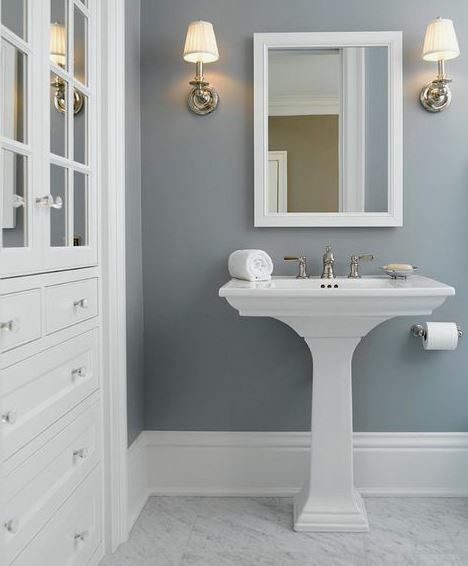 White is always a safe option for bathrooms where light is important, but make sure the white you chose is still a warm white, not cold and grey toned, otherwise your bathroom might end up feeling cold. While you’re painting your walls, keep the painting going and paint your vanity. Vanities in timber or laminate won’t need a huge amount of preparation to paint. 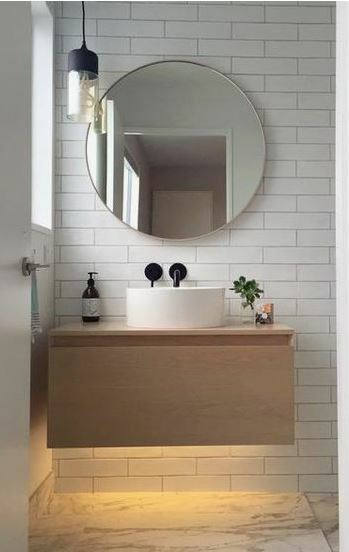 Your vanity is an area that perhaps you could be more daring in your colour choice, think fresh, bright tones like blues or greens to create a fresh, serene space. 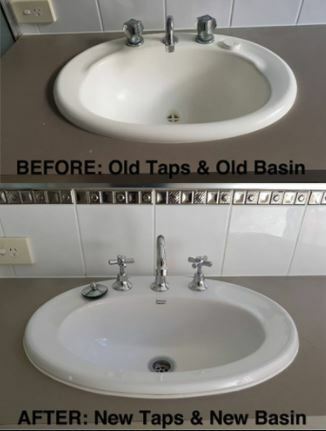 Taps can cop a lot of wear and tear over the years and bring down the tone of an older bathroom. They are often a dead giveaway to the age of your bathroom. They are inexpensive to replace, just ensure your new pieces will fit the existing holes. If you want tapware that will last the test of time, steer clear of on trend pieces in gold or black, classic silver or pewter is a safe option. The easiest way to bring a breath of fresh air into your bathroom is changing your accessories. Have you always had taupe towels? Maybe now is the time to change the colour or perhaps add patterned towels instead? Is your bathroom still lacking? Time to add greenery. 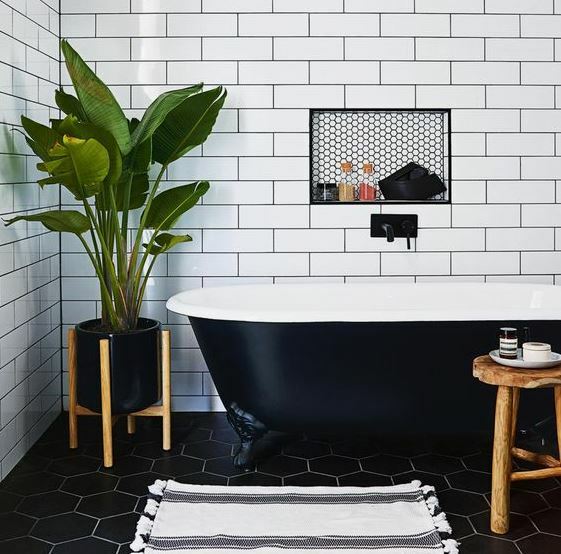 Even the plainest of bathrooms can be transformed by the addition of plants. An empty corner is the perfect spot for plants on a stand or a trio of hanging plants. 5 – Quick and easy bathroom decorating ideas…mirrors. The humble mirror is often overlooked in bathrooms Most people go for the standard wall to wall option – boring. You can don’t think twice about having decorative mirrors in other parts of the home, but this is the one area you actually use the mirror. From traditional mirrors will lots of details to modern styles with clean lines, there is no reason to be boring in this department.